It’s hard enough to write compelling content and optimize it for both people and search engines, but going back and adding links to all of your content one by one? That’s asking a lot. With this in mind, you'll now find a new 'Pillar Module' within the marketplace that can be added to your templates. This module will automatically add the correct pillar page link with the right anchor text to your landing pages or blog posts within HubSpot -- no manual linking required. This is huge step forward in making it easier for you to achieve a site structure that helps search engines better understand your website, which in turn will grow your traffic. In your portal head to the marketplace and search for the "Pillar Module." From there you can install the module, and use it in the design manager for any of your existing templates. We recommend adding it to the bottom of your page content, above the comment section if you have one. For any pieces of content using that template that haven’t been added to a topic, nothing will be displayed. 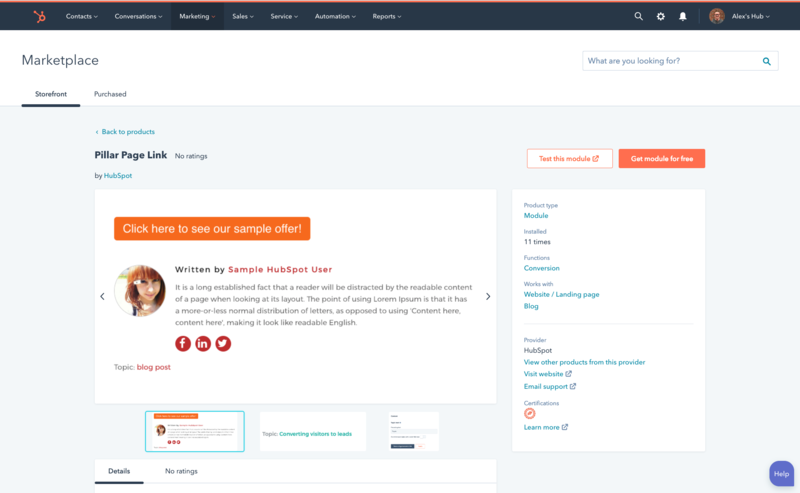 This is now available in the marketplace for all Marketing Hub Professional, Enterprise accounts, as well as all customers of HubSpot CMS portals.